Flamingo Las Vegas Hilton Hotel & Casino Review. Flamingos have been many things to many cultures over the course of history, but one thing that has been associated with them again and again is beauty. Another thing that you will find in different cultures attached to flamingos is good luck. The Flamingo Hilton Hotel and Casino in Las Vegas has combined beauty and good luck in their thematic presentation and for that reason they have managed to harness the full power of the flamingo's image. It is brought to you in the space of one of the best casinos in Las Vegas . 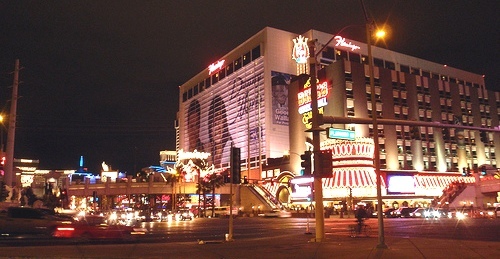 The Flamingo Hilton Hotel and Casino is located on none other than South Las Vegas Boulevard . Furthermore, it is in the region of that street known as the Las Vegas Strip and this puts it smack dab in the middle of the most historic and famous area that the city has to offer. This also puts it close to all of the other excellent gaming, dining, entertainment and nightlife facilities, all of which can be reached through a short walk from the Flamingo Hilton Hotel and Casino. As far as gaming is concerned, Flamingo offers it through a massive space of 77,000 square feet. The casino itself is styled after the casinos in the Caribbean allowing you the chance to play all of your favorite games while at the same time enjoying the festive atmosphere that exists inside the building. The signature game of the casino is roulette, but other table games such as blackjack, baccarat, three card poker, Caribbean stud poker, craps and sic bo are readily available for you to play in. There are also many slot machines available should you get tired of gaming at the tables. There are more than a thousand slot machines available on the grounds of the casino, many of which are some of the most recent games to the industry. You'll always find something new when you visit the slots section of the Flamingo Casino and that means that you'll always be coming back for more. Tired of gaming at traditional casino games? Why not head over to the keno tables then and try you hand at getting lucky at this lottery-style game? There are many other things to keep you occupied as well, such as a betting arena where you can place bets on upcoming sporting events and then watch those events unfold compliments of the Flamingo Hotel and Casino. Finally, if poker's your game and everything else is just tame, the poker room at the Flamingo definitely has a lot for you to like. They offer gaming in both Texas Hold ‘Em and Seven Card Stud, with multiple betting structures available between those two variants. There's no house edge and the rake taken from each pot is quite reasonable in comparison to many of the other casinos around. With Flamingo you get complimentary drinks and complimentary service in some areas, not to mention a rewards program that can really allow you to up the amount you squeeze for free out of the casino.